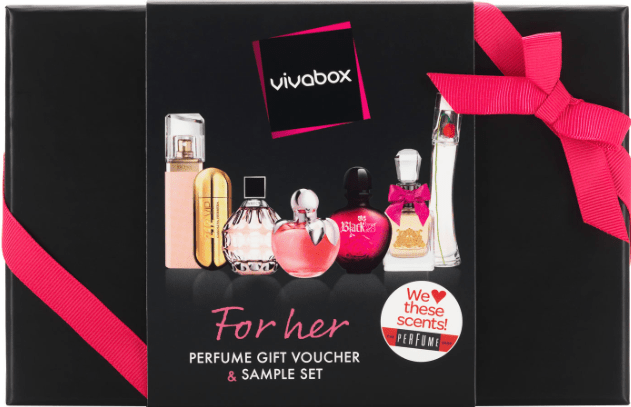 Elixir has a Vivabox for you to win – containing 7 samples of the different perfumes For Her: BOSS MA VIE pour femme, Carolina Herrera 212 VIP, Jimmy Choo, Nina Ricci Nina, Paco Rabanne Black XS, Juicy Couture Viva La Juicy, Kenzo Flower by Kenzo. This box costs £37.99 at the Perfume Shop. The box also contains a perfume gift voucher for you to buy a full sample perfume – the voucher is a code on the bottom of the packaging – and you have until 30 June 2016 to use it – this is worth about £30+. This entry was posted in Promotions and tagged BOSS MA VIE pour femme, Carolina Herrera 212 VIP, Jimmy Choo, Juicy Couture Viva La Juicy, Kenzo Flower by Kenzo, Nina Ricci Nina, Paco Rabanne Black XS, perfume by admin. Bookmark the permalink.